By any measure, Adrienne Rich lived an exemplary life. When she died last March 27, aged eighty-two, she was acknowledged by many critics as perhaps this country’s foremost poet. But she was also a fully engaged radical, committed to battles against imperialism, the subjugation and exploitation of women, and oppression of any sort wherever she found it. Informed by those experiences, she was a lifelong socialist. It was through this prism she lived her life, experienced growth, change, crisis—and flowered as a poet and essayist. When she entered Radcliffe College in 1947, she encountered a world quite different from this one. In the aftermath of the Second World War, old colonial empires appeared to be tottering; in the industrial West workers and people of color organized for change; and, in the wake of the war’s violence and the Depression that preceded it, the first glimmerings of the transformation of human relations could be seen. It was at Radcliffe that she met the great literary historian Francis Otto Matthiessen who, as she said on the fiftieth anniversary of Monthly Review, “reminded us that there was a world outside of Cambridge and Harvard and Radcliffe, a world of war-torn, postwar Europe, in which many things might be possible, many great changes, and that these matters were of concern to us.” Rich was moved by Matthiessen’s radical sensibility, by his commitment to change the world as he saw it. 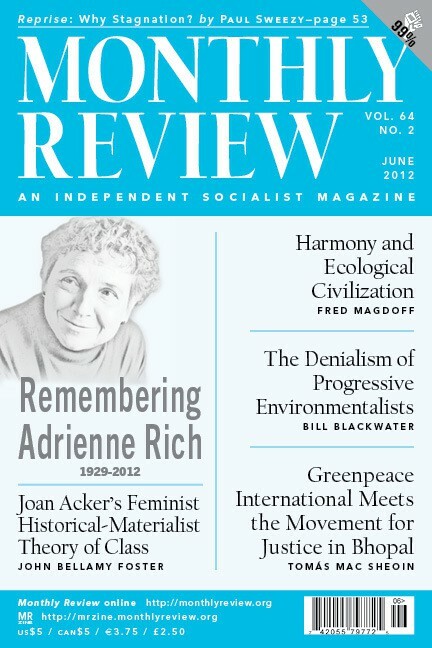 Matthiessen, having provided the funds for the founding of MR had, unknowningly, also contributed to the launch of Adrienne Rich’s life as writer and activist. Matthiessen, she said, “never let us forget that poetry lives in a social world.” She took every course that Matthiessen offered, disabusing herself of the idea that imaginative literature could find validation only in some formal, self-referential aesthetic that lived outside the world of everyday life and history—what was then the dominant reactionary view called the New Criticism. In the 1960s she, her husband, and their three sons moved to New York, where she was immediately swept up in local and national civil rights struggles, the anti-Vietnam War protests, and the emergent women’s movement. Always eager to address struggle personally, she taught in New York’s City University Seek for Education, Elevation, and Knowledge (SEEK) program, which aimed to prepare poor and working-class pupils for higher education, teaching them skills they had been denied by the de facto segregation of the academy. Unflinching in her examination, not only of the world around her, but also of her own life, by 1970 she ended her marriage and came out as a lesbian. Always an impassioned writer, she chronicled her evolution in an increasingly clear, assertive, and imaginative voice in her poems, some of which first appeared in Monthly Review. From 1976 on, she was the partner of the novelist Michelle Cliff. Throughout her writing life, Adrienne Rich’s vision of a better world was clear. In her 2008 collection A Human Eye: Essays on Art in Society Rich claimed Che Guevara, Karl Marx, and Rosa Luxemburg as defining heroes. It did not matter if she was speaking to a room full of undergraduates or, having made the long painful climb up the hill to the Women’s Correctional Facility in Bedford Hills, New York, to teach poetry to its inmates, Adrienne’s voice was trenchant. So it was not surprising that when the commercial media ran obituaries of her, they sanitized her life and work, giving more emphasis to her awards than her work, characterizing her as angry rather than radical. At MR however, we preferred to hear her words: “Responsibility to yourself means refusing to let others do your thinking, talking, and naming for you; it means learning to respect and use your own brains and instincts; hence, grappling with hard work” (from “Claiming an Education,” 1977). In this issue we are reprinting Paul Sweezy’s article “Why Stagnation?,” first published in MR thirty years ago in June 1982 (originally a talk given to the Harvard Economics Club on March 22, 1982). We think that this talk, which could be described today as a classic, is a powerful commentary on our present reality, and we hope will be of interest to a new generation.